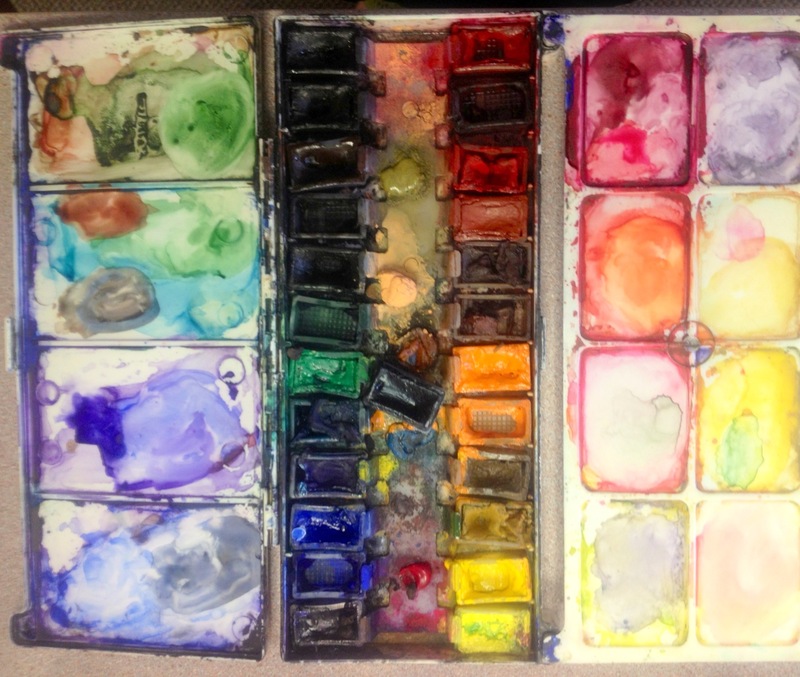 Home Blogs Susan's blog What are the “must haves” in Watercolor supplies? I’ve been painting in watercolors nearly 20 years now and I continue to experiment with various products. Yet, I do have some absolute staples that are always in my art supplies. My students, at Joyful Arts Studio, often ask me, ‘What are the “must haves” in watercolor supplies?” My first and foremost must have is Arches Cold Press 140 pound watercolor paper. 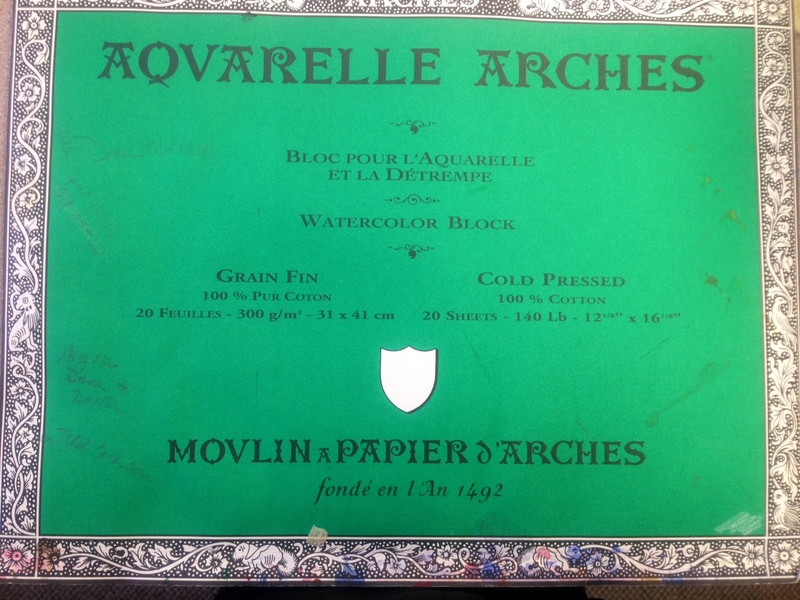 Arches have been making paper since 1492 and they’ve got it down. I’ve had many students come to me with other papers but ultimately after one time painting on Arches switch and never return to other papers. I purchase my Arches watercolor paper in sheets 22 x 30 inches; I find it to be the most economical. I fold and tear the paper into the size sheets I need. What makes Arches Cold Press watercolor paper so great? It is a consistent paper; I can always count on the quality of this paper. Watercolor painting is in my mind the most challenging paint media due to the many variables that impact the painting process. These variables include the water you are using, is it hard or soft water; has the water been treated with chlorine and other chemicals. Another variable is the weather outside has a direct impact on drying time. If it is extremely humid, the paper will dry slower. If it is hot and dry outside, the paper will dry quicker. I use Yarka pan watercolors and always have. Yarka’s are relatively inexpensive and last a long time. They come in a set of 24 colors. I find the paints to be rich in vibrant color. The Yarka’s cost approximately $59.99 and I usually purchase them through Cheap Joe’s, just click on the link to go directly to the product on Cheap Joe’s. I have recently been experimenting with Crayola watercolors and have been very pleased with my results. 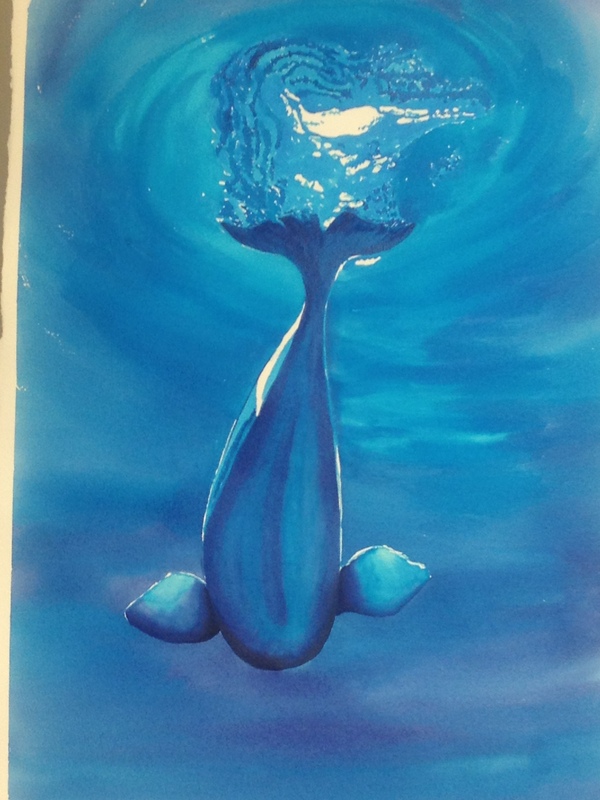 I painted this Beluga whale with Crayola watercolors. 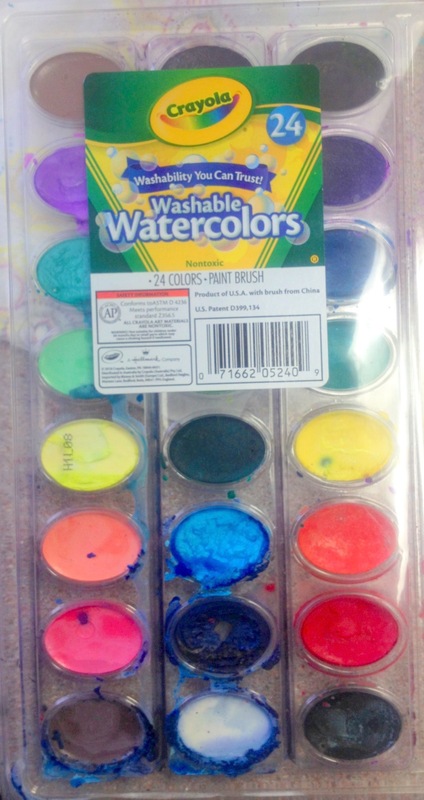 The Crayola watercolors can be purchased at most craft and hobby stores for $10 or less. The nice thing about watercolor painting is you truly don’t need many brushes, although I do have many! However, out of this large tub of brushes I consistently only use three of them. I love Loew Cornell’s Ultra Round Series 7020, #4 round. #4 Ultra Round, Loew Cornell, Series 7020 #4 Ultra Round, Loew Cornell, Series 7020 This brush comes to a tiny point and is all the liner I ever use. You can purchase it on sale at Cheap Joe’s for $4.59, just click the link. I buy them by three’s as I never want to be without a new one waiting to be broken in. I absolutely cannot do without my Dream Catcher #14 round from Cheap Joe’s. I swallowed very hard when I purchased it, it was even on sale but was still over $40 for one brush! Today it is on sale for $38.39 at Cheap Joe’s just click on the link to go directly to the brush. If you want the best bang for your buck then I would recommend the boxed set of Dream Catcher brushes, for $125.99. This box set is everything you will need in watercolor painting! Click on this link to Cheap Joe’s to purchase the set which includes the following brushes: Size 4 Round Size 10 Round Size 14 Round Size ½ Flat Size 1 Flat I also recommend a 1 inch flat brush to wet your watercolor paper, any brand of watercolor brush will work just fine. I am blessed to have the Dream Catcher set so I use the 1 inch brush included. Other items needed, are a divided water bowl. This will keep you from changing water so frequently. 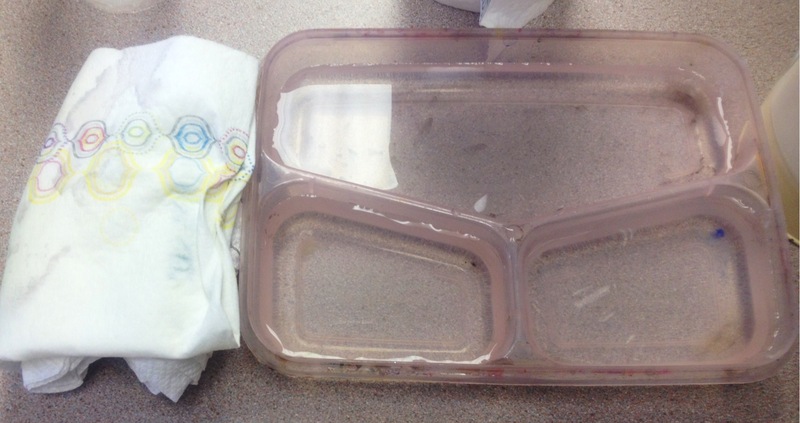 I use a divided Rubbermaid container but you can also choose to purchase a paint brush basin. The last remaining staple I want to discuss today is the paper towels I use. I am a firm Viva paper towel believer. I love how absorbent they are and when I consistently use them it is one less variable in my watercolor painting. I also love the soft, no texture design of Viva. I often use the Viva towels to remove color from my paintings. Other towels are textured and that texture will be left in your painting. Somehow I don’t want quilted weave in my clouds. I also supplement my Viva towels with a kitchen sponge wrapped in Handi-Wipes, held in place with rubber bands. Another important tip I like to provide is the power of an organized workspace in any medium but especially in watercolor painting. If you are reaching across your painting for paint or water, it is so easy to drop something on your painting; which could cause you a huge frustration and disappointment. I always try to have my students organize your painting utensils on your dominant side, right or left. 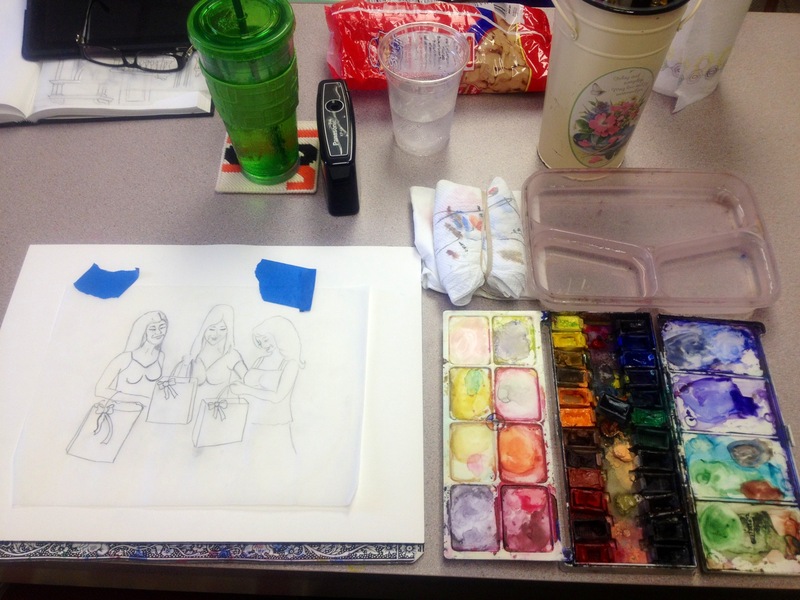 I always have my brushes to my uppermost right, directly below that is my water container, directly to the left of my water container is my sponge/paper towels and directly below my water container is my paint palette. My painting surface is squarely in front of me. I hope you’ve found today’s blog informative. I teach weekly art theory classes in watercolor and other paint media at Joyful Arts Studio on Tuesday afternoon or evening. You can register for classes at www.joyfulartstudio.com. I will be happy to answer your questions, just post them here. Please feel free to share my blog with others. Thanks for reading and have a joyous day painting!